Much more seasonal weather has set in now, typical for the Kola in mid May, overcast and quite chilly with the day temperatures struggling to get much above 6⁰C - 7⁰C. There was the odd snow flake in the air as the boats set off this morning, but luckily the upstream wind of yesterday has reduced to a breeze and that should make casting a tidy, straight line a touch easier. I went up to see Middle Camp yesterday evening and found them in very good spirits. Inevitably there were a few rods reluctant to leave the fishing on Generator Pool for Jemima’s delicious dinner, but hunger drove them in eventually and we had a very noisy, jolly evening before setting off on a chilly run, into a strong wind, back down to Lower Camp. Yesterday Middle landed 65 salmon to their team of eight. All the beats are fishing well although Beach was a bit quieter than normal as was Clarkes. Party Pool continues to be exceptional and Phil J had an extraordinary session there catching four really good fish in succession, all over 10lbs, and all a beautiful, straight from the sea, chrome colour. The new showers in the guest cabins have been received well as have the new dining chairs – one or two of the team mourned the passing of the old plastic ones and said things just were not the same without the chance of your chair collapsing during dinner. 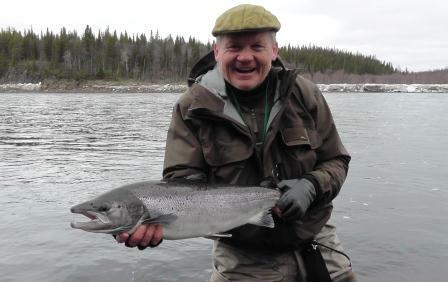 ﻿At Lower Camp Richard M led the charge again with 21 salmon to his rod in the total of 78. 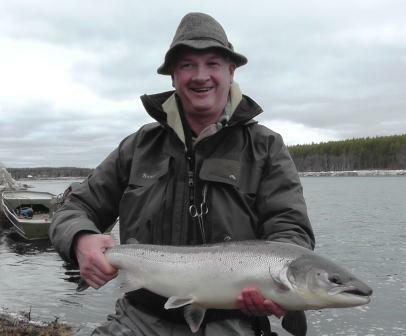 Again we saw some really good fish coming through and 39 of the salmon weighed in the 8lb – 12lb bracket. For some reason Wires and Duck, normally great pools at this time of year, are not fishing that well so today Jamie is concentrating his efforts downstream with Morskoy and Sviats being the beats of choice. We have caught very few kelts down here at Lower, just a handful, yet up-stream at Middle they are hauling them out with one rod getting 28 in a day. For some reason, despite the huge early flood they seem reluctant to leave the middle river. 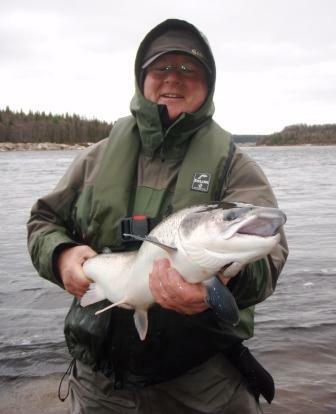 It bears out our feeling here that the salmon tend to run to the calendar rather than water conditions. Despite the big early flood and now the water being a lot lower than this time last year the main run of fresh fish will no doubt hit us in late May and early to mid June as it always does. Today we will take Tom and Donna over to Kitza and tomorrow I will have some photos of the river which we start fishing this Saturday. I'll have the latest news too from Ura about the river and fishing prospects.